Upon leaving the Roman Catholic Church in 1996, Fr. John was able to obtain a job at the International Press newspaper in Lahore where he earned a living as a journalist. He was not going to church at the time, but began looking for a true spiritual home by reading and searching about the Orthodox faith. In July 1998 Fr. John submitted a letter to a Greek man he had met in Lahore years before, inquiring about how to become Orthodox. The man forwarded Fr. John’s letter and eventually it ended up in the hands of Metropolitan Nikitas of Hong Kong and South East Asia. In October 1998 Fr. John received a letter from Metropolitan Nikitas inviting him to enter into a dialogue of how to become Orthodox, thus beginning a correspondence between Fr. John and Metropolitan Nikitas. In 2003 His Eminence traveled to Pakistan and the two met in person. 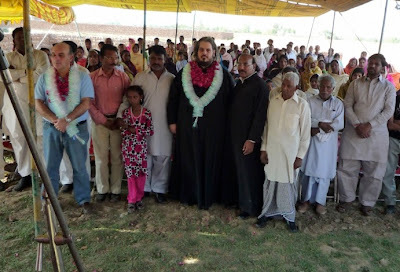 In 2005 Metropolitan Nikitas visited Pakistan again and baptized and Chrismated 300 people into the Orthodox faith. Although not yet an Orthodox priest, Fr. John continued his pastoral activities, sharing the faith with others through conferences and seminars. After being Chrismated in 2005, Fr. John knew he wanted to re-enter the priesthood and so he began preparing for his holy duty. He applied to Holy Cross Seminary in the United States in 2005 and 2006, however neither opportunity materialized as he was declined a visa to the United States both times. With the blessing of the Metropolitan, Fr. John sent away for the materials needed to study and prepare for ordination. Finally, in November 2008, Metropolitan Nektarios ordained Fr. John to the priesthood in Athens, Greece. Since that time, Fr. 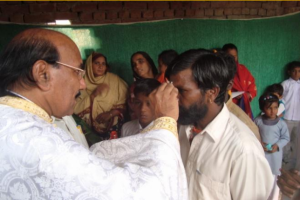 John has continued his ministry, slowly developing, by the grace of God, the Orthodox Church in Pakistan. He and Presbytera Rosy joyously and faithfully stay the course that God has laid before them, despite the many challenges and trials of being Orthodox Christians in Pakistan. As for religious tolerance, the government of Pakistan is officially tolerant of minority religions. Churches are given recognition and people of all faiths are permitted to worship. In recent years, however, Christians have increasingly come under attack — not by the government but by individuals.